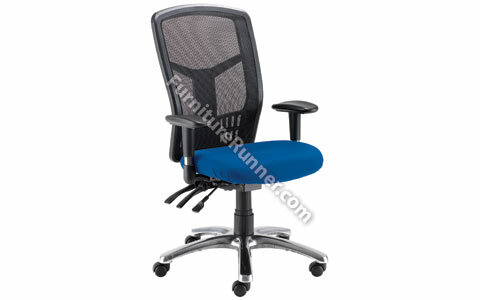 Avior 24 Hour High Back Mesh Operator Chair has a recommended usage time of 24 hours. Seat dimensions: W520 x D510mm. Back dimensions: W500 x H600mm. Seat height: 490-595mm. Adjustable arms included. This heavy duty seating boasts an exceptionally robust and highly adjustable mechanism that is designed for 24 hour use. Covered in Flamblend fabric which is tested to BS7176 medium hazard or leather which is tested to BS7176 low hazard. Has a gas lift of up to 24 stone this complies with BS5459 Part 2. Heavy Duty Seating is designed for 24 Hour use in extreme environments. These chairs are ideal for use in Call Centres, Control Rooms, and other Multi-shift Workplaces The product is perfect for use whilst comfortably working at a desk, in front of computers for typically 24 hours a day. WHAT THIS MEANS: 1. Tested and certified by FIRA. 2. Heavy duty components able to withstand constant 24hr use. 3. 24 stone gas lift. 4. Fully adjustable mechanism. 5. Tested to conform to all ergonomic regulations.